Many of the most brilliant minds in science started with the same title: Intern. Each year, PARC has the pleasure of opening its doors to a new class of enthusiastic interns ready to learn, collaborate and gain real-world knowledge and experiences in their fields of study. 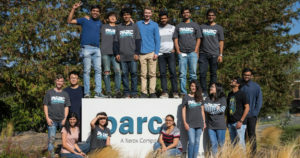 PARC welcomed 27 interns this year from around the world, including India, Sweden, China, Iran, South Korea, the US and more. They join our internship program often as part of their master’s or doctoral programs, and come from some of the most distinguished universities in the world. Once at PARC, interns work on a diversity of projects from all corners of PARC’s four labs: Interaction and Analytics Lab, System Sciences Lab, Electronic Materials and Devices Lab, and Hardware Systems Lab. This year’s internship projects focused on a diversity of disciplines, such as computer vision, model-based reasoning, deep learning, natural language generation, energy devices and systems, visual design, and intellectual capital management. At the end of the summer, PARC celebrates the program with our annual PARC Intern Poster Session, where interns get to share the fascinating projects they’ve been working on. Researchers from around PARC attend and interns get to discuss their work with experts from various disciplines. As the days grow shorter and summer begins to slowly bid farewell, many of our interns prepare to leave and head back to their respective universities. Along with their bags and boarding passes, they take with them newly gained wisdom, memories and tools for the future. Others will continue at PARC until the end of the year, either as interns or research assistants. PARC’s internship program has a rich legacy going all the way back to the 1970s. We consider ourselves lucky to have such promising talent join us each year and always look forward to seeing what great things our interns go on to accomplish. At the start of next year, PARC will begin looking for 2019 interns. Thank you to all of our 2018 PARC Interns! Learn more about PARC’s internship and career opportunities.